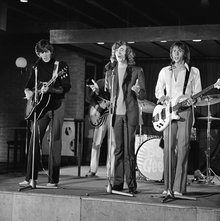 Bee Gees anno 1968: Barrio, Robertinus, et Mauritio Gibb. Bee Gees fuit grex musicus Britannicus a fratribus Robertino (1949), Barry (1946) et Mauritio Gibb (1949-2003) constitutus. Vicimedia Communia plura habent quae ad Bee Gees spectant.